Gr. Circe, mythological daughter of Helios, changed Picus, son of Saturn, into a woodpecker. Nine to ten inches long. 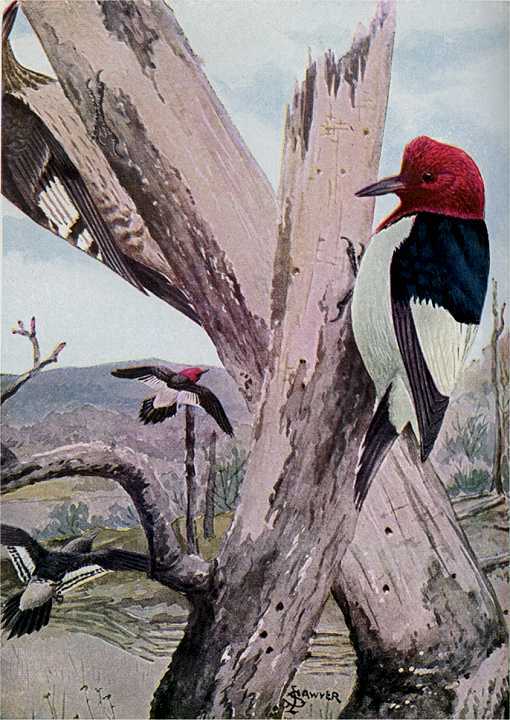 Crimson-red head, neck and upper breast. White lower breast and under side. Black back, upper wings, and tail. Broad white band on lower wings. Colors distinctly separate and contrasting. Inhabits forests, groves, and small stands, sometimes solitary trees in the open prairies and farms throughout most of the U.S. east of the Rocky Mountains and southern Canada. Searches trees for insects. Perches on fence posts in wait for passing insects to eat, which it will catch in flight like flycatchers. Stores acorns, beech nuts and grasshoppers wedged in bark crevices, tree cavities, fence post cracks, in barns, between wood roof shingles and various other nooks and crannies. Also feeds on berries. Nests in cavities it excavates in partially decayed trees or telephone poles and nests in open sheds and bird houses. Lays four to six, more or less, white eggs on soft wood chips at the bottom of its cavity. Eggs hatch after about two weeks of incubation and young leave the nest in another four weeks. The Red-headed Woodpecker Birdhouse (same as for the Golden-fronted Woodpecker and Hawk Owl) has a 6″ by 6″ floor, 14″ inside floor to ceiling, 2″ diameter entrance hole located 11″ above the floor and ventilation openings. Secure hinged roof with shutter hooks for easy access. Nine to ten inches long. 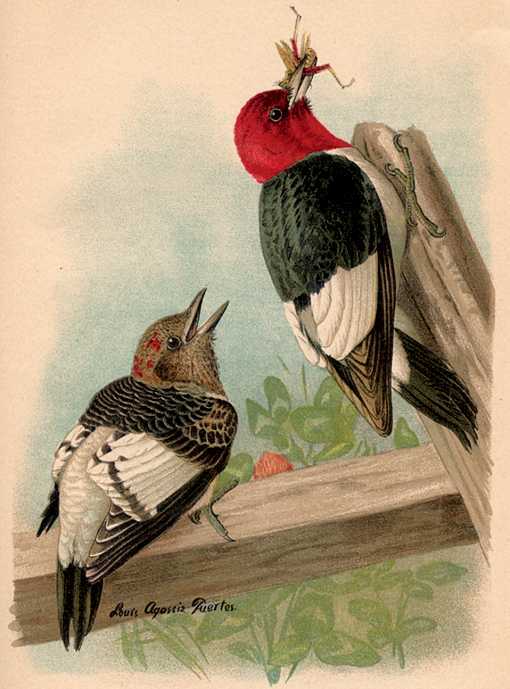 Crimson-red head, neck and upper breast. White lower breast and under side. Black back, upper wings, and tail. Broad white band on lower wings. Colors distinctly separate and contrasting. Mount out of reach on a tree on a woodland edge or clearing. Leave a bed of chips in the house. Remove the nest and clean the box well after the brood rearing season is past.